Birmingham City manager Garry Monk says the club will pull together to overcome their nine-point deduction and secure Championship safety. Blues have been punished for breaking profitability and sustainability rules. The sanction has seen them drop from 13th to 18th, five points above the relegation zone with eight games left. 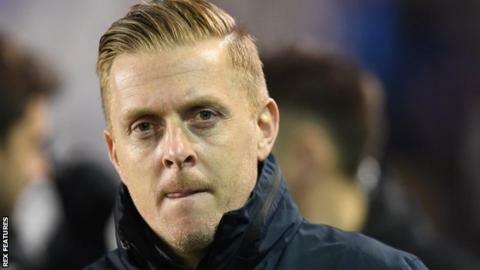 "I'm confident [of avoiding relegation] because I know the players, staff and fans will show the commitment needed to achieve it," Monk told BBC WM. "That fighting spirit that we have will come to the fore - that's why I feel confident. "Yes the points deduction is a blow, we're in a serious situation and it isn't going to be easy, but that spirit we've shown up to this point will come shining through." Birmingham have lost their last four matches and head to West Midlands rivals West Brom on Friday. Albion, meanwhile, have won both their games under caretaker boss James Shan. "Knowing what this league is like, every team goes through the type of runs we're on," added Monk. "We've been very unlucky to lose a couple of those games. If we reach the same performance levels that we have for the majority of the season, that'll be enough to see us to where we need to get to."